Suncheon-si, Tuesday 10 September, 10am. Like many areas of the Suncheon Garden Expo, Hwang Ji-hae’s garden, which was the main reason for my coming to Suncheon in the first place, also limits its reliance on floral colour. 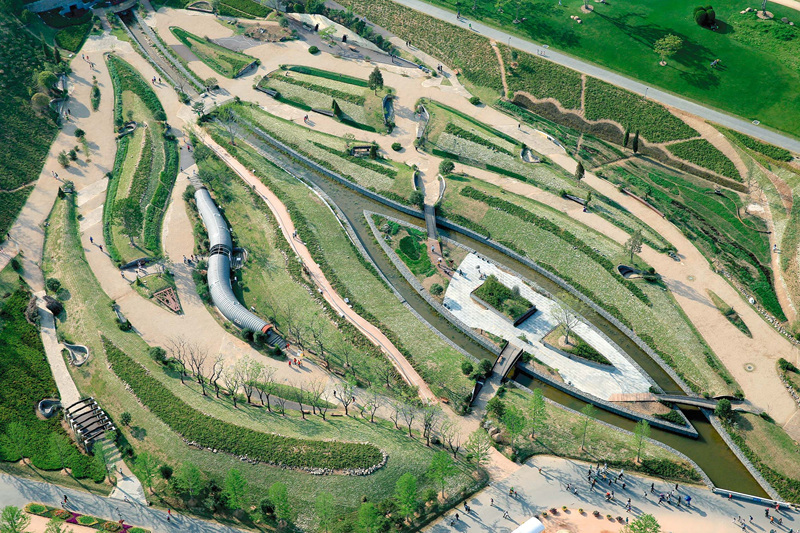 Looked at from above, or viewed from the source of the water (top left of above image) which runs through the plot to feed the Lake Garden, it is shaped like a leaf, its veins formed by the ridges, paths and other distinctive structural features. But in fact the veins are meant to be a three-dimensional representation of the trail left by a lugworm as it wriggles its way across the Suncheon mudflats. The lugworm is an indispensable part of the Suncheon ecosystem, being the first line of defence against pollutants in the tidal area. The plot occupies a huge area, around 45,000 square metres including an adjacent performance area (the “mudflat stage”), which is more than 100 times the size of a typical show garden at Chelsea. Typically of Hwang’s naturalistic desings, it is difficult to find a spot from which to take in a view of the garden as a whole, and even more difficult to capture a definitive view on camera. Instead, one is encouraged to walk around enjoying vistas which constantly change, and to be surprised by the unexpected features: a little green worm here, some ceramics embedded in a bench there, and other little touches which will bring a smile to the face. The central structure of the garden is a worm-shaped library and gallery which provides shade from the intense heat. On one edge of the site is another shaded worm-shaped structure called the Mousehole Café, entered through low mousehole-shaped openings in the curved wall which force you to stoop as you enter. As you take your refreshment you are invited to write messages on the whitewashed interior. Similar to her other gardens there are sculptural features often made out of recycled materials giving the composition a sense of fun. For horticultural interest, the design relies more on foliage than flowers, and the careful placement of her planting make it look as if the garden has been there for year – a trademark of her designs. Nevertheless, the planting will likely change over time: the generous budget would not cover everything she wanted, and if funds allow in future she will plant more trees, providing a greater amount of shade. Nevertheless, the garden seems complete as it is. And even without the additional trees it can therefore be enjoyed all the year round, like the adjacent Lake Garden.